Yay, snuggle buddies! 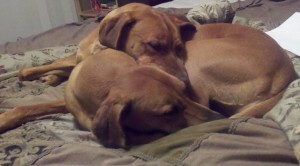 I lurve your doggies. Writing about real places… hm, I’ve heard that some writers look up travel guides, and Google Maps, maybe? (Though that sounds very creepy and stalker-ish.) I avoid this all by writing about places I know. But places that are interesting, like a horse stable, in the hopes that people think me a varied and cultured person. An outline? Eek, is right! Actually, I’m turning more into a plotter than a pantser myself…scary. And admittedly helpful at times. Thanks Yahong–my girls ARE pretty cute when they aren’t being naughty. Which is about 50% of the time. And I LOVE Google Maps for research–I’ve used it a ton so far. Alas (or actually–THANK GOODNESS!) Google Maps doesn’t provide any photos of building interiors, only exteriors. Amanda–good luck with the plotting! Jenn–totally agree that outlining is tough! 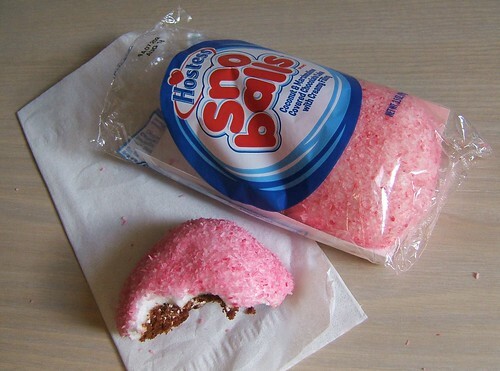 Also, I’m not really a huge Sno ball fan either, but I used to LOVE those little fried pies. Mmmm…. I love outlining. I’ve written both ways, and I think I’m more successful when I outline. your dogs are so sweet!!!!!!! how can you not be inspired to write with that in front of you? Oh, goodness. You are too funny. And you will rock that outline. I have complete faith in that.